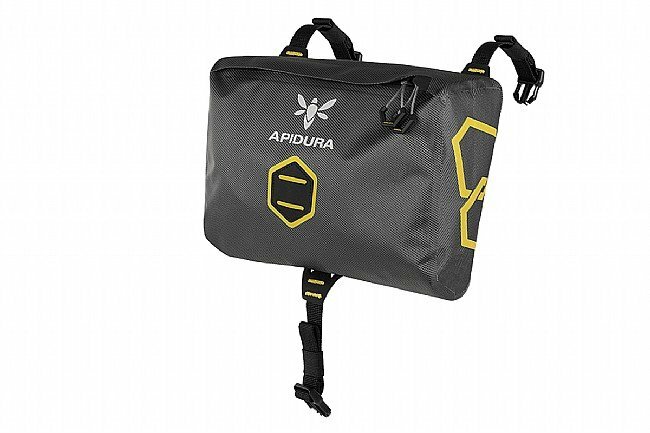 If you're already sporting one of Apidura's excellent handlebar packs, then this Accessory Pocket Dry lets you clip on 5L of additional waterproof storage for that second lunch, your sensitive electronics, and other goods. Its custom waterproof fabric is lightweight, highly abrasion- and tear-resistant, and is joined with welded seams and a full-length protected water-resistant zipper to stand up to prolonged wet weather riding. Inside, there's a mesh organizer pocket to keep you traveling tidy, and the yellow liner helps you from losing those small items at the bottom of the pack. 5L capacity. 10.6" length x 7.9" height x 3.1" width. Claimed weight is 120 g. Features reflective accents for increased visibility. Compatible with Apidura handlebar bags only. This accessory pocket clips on to an Apidura roll handlebar bag. 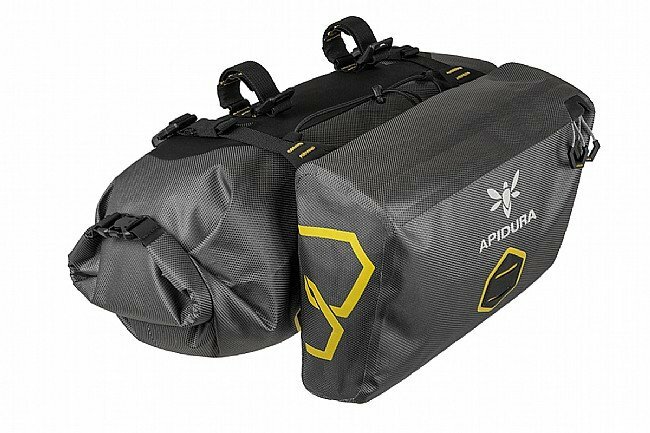 I use the smaller size roll bag from Apidura because it has just enough room to carry a summer weight sleeping bag. This bag clips on to the roll bag and can store snacks, maps, extra gloves, sunglasses, etc. It attaches securely, but I wouldn't use it to carry anything too heavy because it might shift around a little. For lightweight, waterproof storage though, it is high quality and seems watertight. The Apidura Accessory Pocket-Dry was a valuable addition to my bikepacking kit. With the water tight dry bag roll on my handlebars, I needed somewhere to carry a headlamp, sunscreen, chapstick, battery pack, and other needed items. This pocket kept things close at hand and accessible. It was a challenge to open while riding, however, I appreciate the water proof zipper and close at hand accessibility. Very well made and designed. I love how it attaches to my Apidura handlebar roll. It is adjustable as far as where it sits on top of the roll. Just about the right size for key items. Very happy with my Apidura kit. I used this bag with the Apidura handlebar bag to bicycle across the US on my carbon road bike. Completely waterproof, attaches securely, works perfectly.